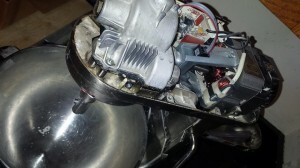 SO, when the motor burned out, we had it repaired at Kitchenaid’s factory. It took several weeks and a couple hundred dollars, but it came back completely refurbished and feeling brand new. While it was gone, I pulled out a bread machine I’d bought to use in a giveaway. It’s a really nice one, but I had never used a bread machine before – I used a mixer. However, I’m not good a kneading bread by hand so I gave in and used the “dough” setting on the bread machine. Goodness, it’s so much easier. I use this one. I put all of the ingredients of my bread into the machine at one time, liquids and yeast in first, flour on top — then hit “go”. About 2 hours later, I have risen dough ready to be formed by me. Now, I don’t like it when the bread machine bakes my bread – I don’t like the shape of the pan and I don’t like the temperature that’s used. But, I LOVE not having to use the mixer. So, this week I was making French Bread for church – I needed four large loaves and didn’t want to use the bread machine because I would have had to do it four different times – instead I was able to make the dough for two loaves at a time in my mixer. Only, part-way through kneading the second batch, my motor burned out again. 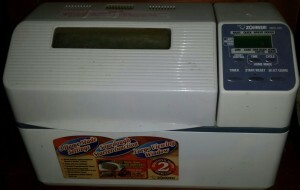 The bread machine’s motor is designed for mixing bread. The mixer’s motor is designed for mixing, but not necessarily for regular use for making bread. So, now I either need to replace it or repair it again. In the meantime, I’m sitting here without a mixer – a lifeline in my kitchen. Wow! So sorry you’re having problems with your Kitchen-Aid. I’ve had mine for about 15 years and use it almost exclusively for mixing up bread. Mine is a smaller one so it only holds 6 cups of flour at a time and I don’t break that rule. I did once – accidentally – and haven’t done it again. I used to have a bread machine and I really did like using it to mix up bread. 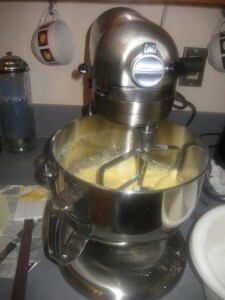 (Formerly the Electrolux Assistent/Magic Mill DLX/Verona stand mixer) I am in no way “related” to this mixer … it just works!